BRP Hot Rods: Transmission Mount Adapters BRP Hot Rods.com - conversion kit specialists for GM vehicles. 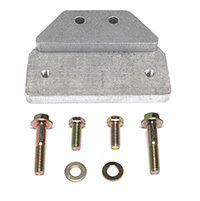 Transmission mount adapter that adapts 8L90E automatic tailshaft housing to traditional transmission mount. To be used with our transmission crossmembers. Transmission mount adapter that adapts 2009-2014 CTS-V 6L80E automatic tailshaft housing to traditional transmission mount.